When Google unveiled the WebM project at Google I/O a few weeks ago, one partner’s browser support was notably absent: Google’s. Sure, they added VP8/WebM support to Chromium, the open-source browser behind Chrome, but that flavor is used by a small fraction of the people who use Chrome itself. Starting today, Google is finally joining Firefox and Opera with WebM support in Chrome itself. As they note on the Google Chrome Releases blog, WebM and VP8 (the actual video codec) has been added to the dev channel of Chrome across Windows, Mac, and Linux. While it’s not yet in the beta or stable builds of the browser, it will probably be added there very soon, once it’s proven to work in the dev build (which you can download here). And it is working. YouTube is one of the first sites with videos that support WebM, and anyone with a browser that also supports it can start watching the videos now. Simply go to the YouTube HTML5 page and opt-in to be a tester. One you do this, search for a video and add “&webm=1” to the end of the URL to return WebM videos. 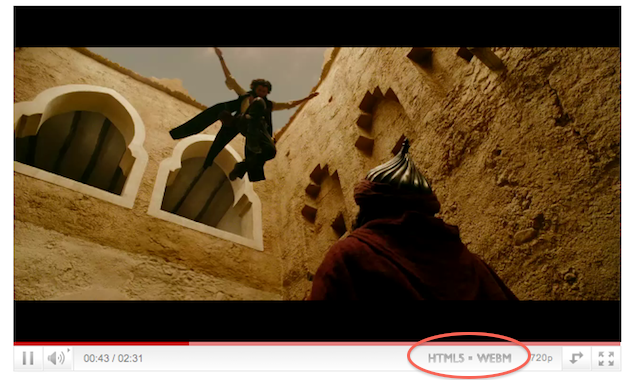 When you start playing one, you’ll know it’s working if you see the “HTML5 – WEBM” notation in the lower bar. The videos also works great in HD and when expanded to full screen mode. So, WebM is now ready to roll in Chrome, now Google just has to worry about those pesky patent lawsuits.